Patients who are dissatisfied with certain elements of their smile can benefit from porcelain veneers at our Palm Desert, CA practice. This cosmetic dentistry treatment can mask aesthetic imperfections, such as discoloration, chips, cracks, mild misalignment, and other issues. Understanding what to expect before, during, and after treatment can help patients have a smooth, comfortable experience. So, how long will it take to adjust to veneers? Dr. Lemay answers this question and explains how to properly care for your veneers so they will last for years to come. Crafted from layers of medical-grade porcelain, veneers are designed to fit on the front surfaces of the teeth. These veneers are incredibly durable, but thin enough to deliver natural-looking results. 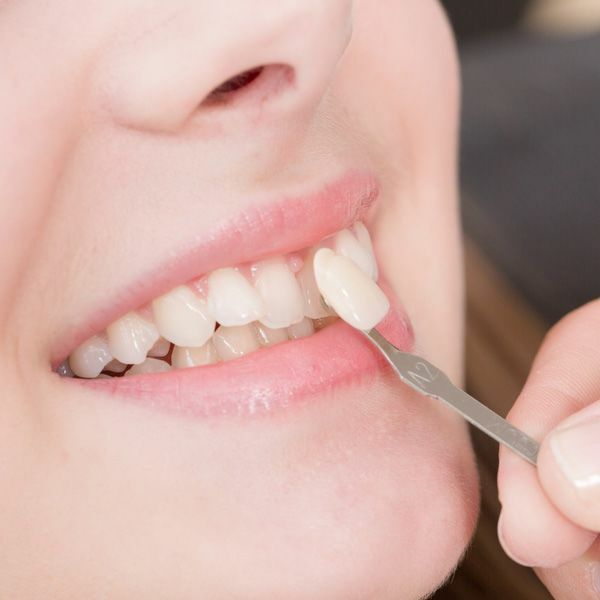 To place veneers, your doctor first removes a small amount of enamel. This creates more space for your veneers and also helps create a stronger bond. Once the teeth are prepared, impressions are taken. These molds are used to design and fabricate your porcelain veneers. Once they are ready, Dr. Lemay will then assess the fit of your new veneers and make any necessary modifications. Any change in the oral cavity, no matter how minor, will be noticeable. Your tongue and gums are sensitive to these changes, and it may take some time to become accustomed to your new veneers. Most patients agree it takes approximately two weeks for your bite to feel normal and for chewing and speaking to feel completely natural. Any sensitivity that occurs after veneer placement should be temporary. These side effects begin to fade within the first few weeks. Steer clear of hard, crunchy foods such as ice cubes, peanut brittle, or candy apples. Consider a night guard if you clench or grind your teeth. Attend all routine dental examinations and cleanings. Rinse with warm saltwater if your gums feel sore or tender. Brush daily with a soft-bristled toothbrush and a non-abrasive fluoride toothpaste. Consume dark-colored foods and beverages in moderation to reduce the risk of staining. If a veneer becomes damaged, be sure to inform your dentist right away. Prompt care can reduce the risk of further complications. Patients considering veneers should know that their veneers will need to be replaced at some point. However, due to the high-quality materials used in dentistry today, custom veneers last longer and longer. On average, veneers last about 10 to 15 years. However, with appropriate care and maintenance, they can last upwards of 20 years. Are you thinking about porcelain veneers as part of your cosmetic treatment plan? If so, schedule a consultation at our practice. Dr. Lemay can perform a full assessment and design a personalized treatment plan to meet your needs. You can call our office or contact us online anytime.